The Government of Jamaica is aware of the strategic value of health to the transformation of the Jamaican society and the critical role health must play in reconstructing the social landscape of the country. Since the health system figures predominantly in reversing the cycle of poverty, access to quality services especially for the most vulnerable is atop the development agenda. In keeping with the World Health Organization philosophy of health as a fundamental right of every citizen, the Government is keen on providing universal access to quality care at the primary level, while investments are made to improve the infrastructure and service delivery at the secondary and tertiary levels. Jamaica’s outlay of health facilities includes over 330 health centres, 24 public hospitals, the University Hospital of the West Indies, a regional teaching institution partially funded by Regional Governments including Jamaica, 10 private hospitals and over 495 pharmacies. The public health sector accounts for some 5,000 hospital beds, while the private sector provides approximately 200 beds serving a population of 2.7 million. The 24 public hospitals are spread across the nation’s 14 parishes and four Regional Health Authorities and are designated A, B and C based on the range of services offered. Over the past decade or more there has been a shift in Jamaica’s epidemiological profile from communicable to noncommunicable diseases (NCDs) arising largely from lifestyle changes. These rapid changes in the conditions and pattern of diseases as a result of changes in the global environment continue to have a major impact on Jamaica’s health conditions. Since 1982 cardiovascular diseases, diabetes and cancers have been the leading causes of death in Jamaica. 2009 figures show that NCDs accounted for approximately 60% of deaths among men and 75% of deaths among women. Hypertensive diseases and ischemic heart disease were ranked third and fourth while breast cancer and cervical cancer ranked sixth and eighth. The four underlying risk factors – tobacco use, unhealthy diets, physical inactivity and the harmful use of alcohol – are largely responsible for the development of NCDs. These risk factors are fairly common in Jamaica. The 2008 Jamaica Health and Lifestyle Survey shows that 65% of the population 15-74 years old currently uses alcohol. By the age of 16 years, 19% of smokers had initiated smoking and 14.5% currently smoke cigarettes. Almost a half of the adult population was classified as having low physical activity or being inactive. Over 90% of persons who were diagnosed as being obese, having a high blood pressure and having high cholesterol were not on a specific diet for their condition and about 99% of Jamaicans currently consume below the daily recommended portions of fruits and vegetables. The Government believes that increased focus on community involvement in care through the development of primary healthcare is the best approach to combating these conditions and to addressing these health realities. The Ministry of Health has therefore invested in a programme of primary healthcare renewal through which it has embarked on the establishment of four Centres of Excellence at the primary care level, one in each of the four Regional Health Authorities and to date has refurbished over 80 health centres islandwide to better equip them to provide optimal service in keeping with the needs of their respective communities. Some of the gains that we boast today have been built on the foundation of a strong primary healthcare system. This is characterised by a good network of community based health centres, hospitals that are strategically located, active community participation in health and a well-trained and dedicated cadre of healthcare professionals as well as the provision and expansion of the health infrastructure. The Ministry is also keen on achieving these and other health goals through public/private partnerships and greater engagement of the various NGO communities and other stakeholders. The government is laying the foundation for a brighter, healthier future with an emphasis on providing quality healthcare for all, with universal access at the primary healthcare level. In this way we can achieve the mission of Jamaica being the place of choice to live, work, raise families and do business as outlined in our National Development Agenda, Vision 2030. ‘Land of Wood and Water’, lies south of Cuba and west of Haiti. markedly cooler in the mountains. Rainfall ranges from 1,500 mm p.a. in Kingston to 3,850 mm p.a. in Port Antonio. Jamaica lies in the hurricane zone. Environment: The most significant environmental issues are deforestation; pollution of coastal waters by industrial waste, sewage and oil spills; damage to coral reefs; and air pollution in Kingston due to vehicle emissions. birth rate 18 per 1,000 people (35 in 1970); life expectancy 73 years (68 in 1970). The population is predominantly of African descent (91% in 2001 census), with European-, East Indian- and Chinese-descended minorities, and some people of mixed descent (6%). 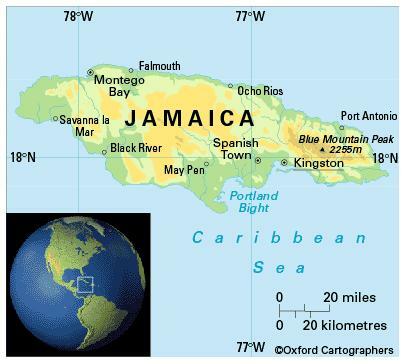 Economy: Jamaica is classified as an upper-middle-income economy by the World Bank.